This recipe is an attempt to keep young and old happy while the ketchup still hopefully tastes of (mainly) tomato! Although tomatoes are available all year round we find the late August/September British ones (usually our own or Granny's) make the best flavour packed, deep red ketchup. Roasting the aubergine with raspberry vinegar gives a lovely tangy flavour when combined with the pickled walnuts. With the addition of olive oil, it has a silky caviar like texture and is excellent with freshly made flat bread. This alternative cottage pie has a deep flavoured brazil nut base and a velvety layer of butternut squash. The addition of a layer of wilted spinach makes this into a special occasion recipe. This dish is gluten free. The idea behind this fresh marinated salad is based upon the Peruvian national dish of seafood simply marinated in lemon and seasalt. By using finely shaved fennel and a little raspberry vinegar this tangy salad is perfect with creamy avocado. Green tomato chutney is cheap and easy to make, with a rich tangy sweet and sour flavour. 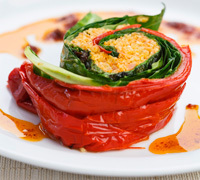 It is extremely versatile and an excellent addition to all sorts of vegetarian dishes. The best Middle Eastern Hass avocados and Alfonzo mangos from India and Pakistan overlap in their seasonality for a few weeks in March. Try serving this salsa with something crispy and slightly salty, like our feta and sundried tomato galette. This fragrant warming broth is good at all times of the year, it's relatively simple to make and always proves popular. You can use vegetable stock cubes instead of fresh stock. If you don't make the chorizo, it's delicious with good pitta slices, pistachios and chilli oil. Cooking the porcini mushrooms down to a glaze and then combining them with a 'roast hazelnut butter' produces a pate with a huge and complex depth of flavour. It's dairy and gluten free and is a hit with vegans and hardened carnivores alike. Serve with a fruity jelly like Crab apple or Rowan. We used many variations of this sauce at Cafe Maitreya, it doesn't involve any bones or processed stock cubes and still packs a great savoury punch. The stock can be used as a base for many vegetarian dishes, sauces and soups. This simple fragrant tagine is designed for adults and children; it can be made in around an hour and costs around a fiver. Serve with steamy couscous or rice. The combination of sweet roast Romano peppers, a sharp super fruity raspberry vinegar dressing and crunchy roast hazelnuts is worthy of being a meal on its own. Rowan berries, the fruit of the mountain ash, which is common throughout Britain, are best picked in September/October. They make the most delicious tangy, orange-red jelly which is a great accompaniment for cheese, veggie sausages and is particularly good with globe artichoke. Figs are a wonderful thing, but are only at their very best and most affordable for a short amount of time (late september) unless you are lucky enough to live in the Mediterranean. I find that out of season figs are generally dry and bland having travelled so far. This tangy herby dressing takes minutes to prepare, will keep for a good week and is a delicious accompaniment a great variety of vegetarian dishes. Fennel is one of those vegetables like aubergines which seem to be reasonably good and accessible all year round. By braising with orange, stock and olive oil at a low temperature the fennel becomes succulent and tender. 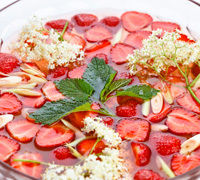 This simple fresh 'punch style' dessert has all the floral sweet flavours of early summer. The unusual fruity lemon flavour of Sumac works really well with sweet almonds and olive oil. We have found it is particularly delicious with asparagus. Simply blanch the Asparagus and toss in a pan with the Sumac pesto and extra olive oil, salt and pepper. This paste keeps well and is very versatile. It can be used as a seasoning or as a base for sauces, and is delicious with cheese or salads. As the chillis are slow cooled you get all the flavour but the just the right amount of heat. 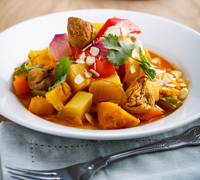 This deep flavour one pot tagine is a great winter warmer and relatively quick and easy to make. Its deep, floral flavour also works well in summer with peppers, aubergines and courgettes. The list of ingredients is a little daunting, don't worry if you can't find them all. Try this for a burger which is bursting with nuts, seared and crispy on the outside with a flavour packed moist centre. This rich, chocolatey sponge can also be made with gluten free bread flour instead of plain flour and 2 flax eggs. The sponge is also sugar free. It took about 3 years to work out the secret to the texture, and its as simple as not cooking the chick peas; soak overnight, rinse carefully and add lots of aromatic seasoning, then cook from raw to order. Learning that chick pea water has a similar protein binding effect to eggs has been a revelation. Tinned chick pea water seems to be more consistent, strong acids such as lemon juice can split the sauce, so I tend to use a quality vinegar to add zing, such as white balsamic. These meringues are crispy and neutral flavoured just like their counterparts with eggs. Add vanilla seeds or lemon zest at the end of the process for extra punch. Using tofu as a protein base has been a real eye opener, the texture of this cheesecake is rich, creamy and light. Everyone who has tried this one has said they do not miss the cream cheese, which alone has a pretty neutral flavour too. This recipe makes about 15 to 20 fat sausages which can be deep fried, shallow fried, baked or grilled. From mid-March until the beginning of June, many woodlands in the UK are strewn with Wild Garlic leaves and flowers. This delicious pesto is great with cheese, crusty bread and as a condiment with pastry dishes.